As any reader of Photography is Not a Crime, the First Amendment blog by Carlos Miller, can tell you, some police officers hate having their actions recorded without their permission. 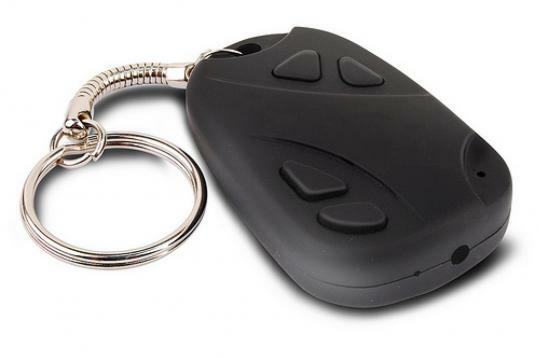 So, I can only imagine how a police officer might react to being caught on disk by Swann Security’s latest spy camera, which is hidden inside a black gadget made to look like a car remote control and which hangs from a loop on your keychain. Swann made its name in the security business, with cameras designed to catch shoplifters and home invaders in the act. But the company’s RemoteCam pinhole video camera, which will cost about $100 when it becomes available in a few days, is meant only for what I would classify as “offensive’’ purposes. Journalists and police officers might find the RemoteCam handy for their undercover investigations. But so might perverts on the T, as well as private detectives spying on unfaithful spouses at North End restaurants. The RemoteCam also snaps still images at 1280 x 1024 pixels. The RemoteCam is 2 inches long and weighs a bit less than an ounce. You download your videos and recharge the RemoteCam via the USB cable that comes with the device. A single charge lasts 60 minutes. VTech is pitching its new $60 MobiGo and V.Reader devices as a means for Mom and Dad to get their iPads and Kindles back. I am not quite sold on the idea. It is true that my 4-year-old daughter, Oona, seems almost as happy playing with the handheld LeapFrog Leapster2 toy (a similar education-and-play device) as she is with my iPhone or T-Mobile G1. But Oona’s 7-year-old sister, Maeve? She will never settle for anything less than a bona fide mobile phone or e-reader of her own. Titles for the MobiGo, which VTech expects to appeal to children ages 3 to 8, include Disney Princesses, Disney Fairies, Toy Story 3, and Shrek 4. The titles (each is about $20) include games, coloring, and music-playing activities, which might make rained-out summer days pass more quickly and productively. MobiGo is a touchscreen device, with a QWERTY keyboard for young typists. The V.Reader will work with up to 100 downloadable, “animated’’ books, which are priced at about $20 apiece and include games and dictionaries tied into the actual texts. The lot includes more of the same Disney fare, as well as Scooby-Doo and Dora. The V.Reader also teaches word recognition and vocabulary skills to young readers, ages 3 to 7, according to VTech. If your child happens to be at the high end of that range, however, and has been spoiled by too much time with “Alice in Wonderland’’ on the family iPad, I am afraid the V.Reader will not be able to compete.